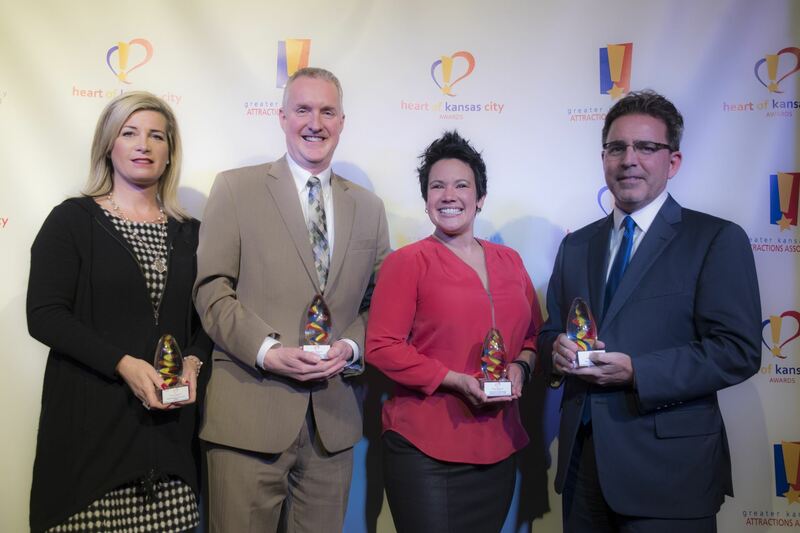 2017 Heart of Kansas City Awards! Allied Member of the Year (honoring an allied member that demonstrates excellence in supporting the tourism and hospitality industry) - Visit KC was selected for this award in honor of its work to support the tourism industry in general throughout the region, and helping grow annual visitation to over 25 million in the last year. Traci Moon, Senior Vice President of Marketing and Communications, accepted on the organization’s behalf. Ambassador of the Year (honoring an outstanding front of house staff member or volunteer who demonstrates exemplary effort in helping to further the goals, objectives and spirit of the tourism and hospitality industry) - The Association recognized Barry Myers, a member of the front line staff at the Kauffman Center for the Performing Arts, for his exemplary customer service. Individual Achievement (honoring an individual who goes the extra mile and puts forth exemplary effort in helping to further the goals, objectives and spirit of the tourism and hospitality industry) - Presented to Celeste Lupercio, Director of Sales, Marketing, and Events at The College Basketball Experience. Celeste was selected for her commitment to several organizations including SKAL International, the American Royal, the Big 12 Organization Committee, as well as the GKCAA. Attraction of the Year (honoring an attraction that demonstrates excellence in advancing the goals, objectives and spirit of the tourism and hospitality industry) - Union Station Kansas City was recognized as the Attraction of the Year for its exemplary attendance of over 1.8 million, its world-class special exhibit program, seasonal celebrations and programs like the Makers Faire, and recent upgrades to Science City. Michael Tritt, Chief Marketing Officer, accepted on the organization's behalf. Award recipients were recognized at the GKCAA Annual Member Meeting at Musical Theater Heritage in Crown Center on November 16, 2017.